In the past few weeks, there have been some major shifts in the BitTorrent community which have had a resounding impact on the larger world of peer-to-peer (P2P) file sharing. They’ve led to some of the largest BitTorrent sites completely changing focus, or figuring out smarter ways to continue sharing files illegally. Meanwhile, Adobe announced a massively interesting inclusion in their upcoming Flash player 10.1 update – a seemingly innocuous version number that is adding some world-changing P2P technology to Flash video streaming. I’d like to discuss these opposing trends of illegal versus more legitimate uses of P2P technology, and what they ultimately mean for how we use the Web. First, The Pirate Bay shut down their tracker for good. The site used to boast having “the world’s largest Bittorrent tracker,” but is now opting for a different approach. 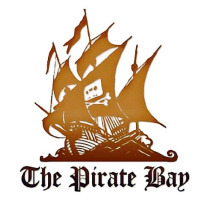 The Pirate Bay is using a combination of DHT (a de-centralized P2P network) and PEX (peer exchange, a method for gathering peers) to share files directly between peers without the use of a traditional tracker. They’re also doing away with torrent files by offering “magnet links”, which send torrent data directly to BitTorrent clients. Mininova, another popular BitTorrent site, recently announced that they’re going completely legit by removing all of their copyright-violating torrents. Mininova has historically been more cooperative with authorities when it came to cracking down on copyright infringement, but such a drastic move from them is still surprising. The fate of these two BitTorrent mainstays is a direct response to recent legal pressure, and it’s also telling for the future of the protocol. One gives up illicit activities completely, and the other finds a way to further remove themselves from blame. Honestly, I’m not sure how long The Pirate Bay can keep up their efforts without going completely private, especially if smaller BitTorrent sites are forced to go legitimate like Mininova. Overall, legitimacy seems to be the wisest course of action for BitTorrent sites that don’t want to be as confrontational as The Pirate Bay. It also falls in line with the changing tide we’ve been seeing with commercial use of P2P techniques for the past few years. Gone are the days when P2P just referred to illicit file sharing. Now, many companies are relying on P2P networking as a key component of their products. In short, multicasting is the notion of distributing one piece of content from one source to many destinations – all without the load of delivering it to everyone requesting it. On large local networks – streaming a corporate event, for example – this often occurs right at the routers. 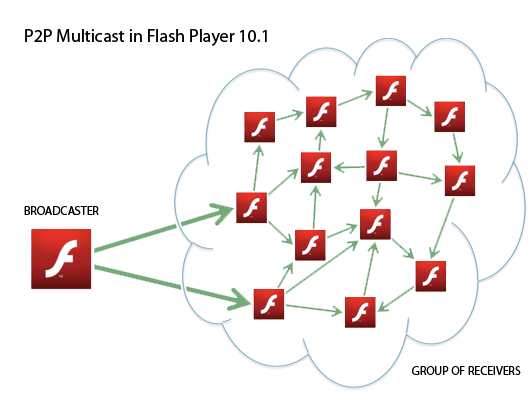 With Flash player 10.1, Adobe is making it possible for content distributors to multicast content by having viewers transparently share the stream. According to Adobe, this will allow Flash video streams for huge events with millions of viewers – even for something as large as the US presidential inauguration. Flash player 10.1 will also allow developers to build more traditional P2P applications within the browser, or as a standalone application via Adobe Air. One of the most hotly anticipated services for many music lovers is Spotify, a currently Europe-only service that utilizes P2P to allow users to instantly stream music. The Spotify application looks like a cousin to iTunes with Napster as another close relative, as it should – the service marries the desire for free tunes with the legitimacy of iTunes. The contents of each client’s cache is summarized in an index which is sent to the Spotify stream hub upon connecting to the service. This index is then used to inform other clients about additional peers they can connect to for fetching streamed data for individual tracks being played. This is accommodated by each client, upon startup, acting as a server listening for incoming connections from other Spotify users, as well as intuitively connecting to other users to exchange cached data as appropriate. While broadband speeds are increasing worldwide, there will still be many reasons to adopt P2P methods for distributing content in the future. Primarily, it severely reduces the bandwidth load for content distributors, and it prevents the danger of overloaded servers for important events. For users, it means more reliable content delivery overall (since there may be no single point of failure), and reduced costs since content providers are saving money as well. There’s no denying that illegal uses of BitTorrent and other P2P technologies will continue, but on the other hand P2P technology will also help legitimate efforts to offer free and inexpensive ways to legally access content. 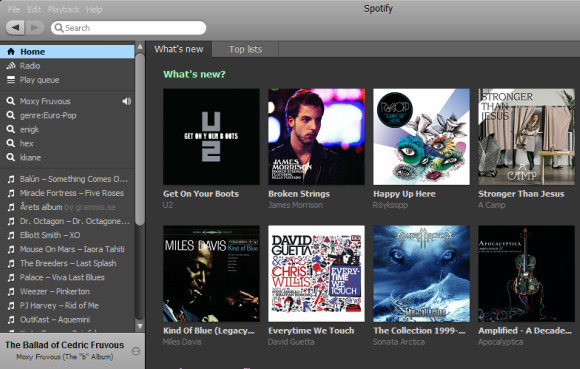 Spotify, for example, could make many users give up illegal music downloading due to its convenience and ease of use. As legitimate means of accessing content become more widely available, many users will find less reason to pirate. How ironic it is that P2P, once seen merely as the source of content providers’ woes, could potentially be their savior.